Climbers come to Moab for a chance to summit some of the most difficult and unique routes in the southwest with challenges including sheer canyon walls, vertical sandstone spires, and towering crack climbs. 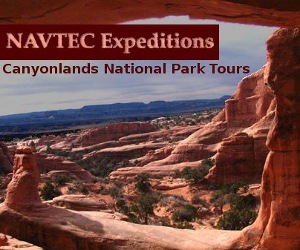 Offers 5 Guided Canyoneering trips from 1/2-Day introduction tours to remote world class canyons. 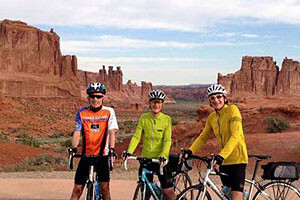 Established in 1997, we offer Moab canyoneering, rock climbing, packrafting, camping and multi-sport adventures. All trips are private and customized for your family or group. A variety of canyoneering, rock climbing and hiking trip options - multi-day, family focused, designed for varying fitness levels. 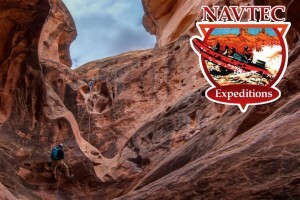 The oldest climbing service guide in the greater Moab area. All equipment included for any climbing adventure you desire. Challenge yourself to a leadership course with NOLS. Since 1991 this worldwide leadership school has been operating in the Southwest from May to September. Outward Bound offers wilderness courses, custom and school programs aimed at reform around the US and beyond for people of all ages. Worldwide travel company offering unique vacation experiences, biking, hiking, kayaking and rock climbing in Utah, dates and rates vary, lodging and camping inclulded. The Wall Street climbing area is conveniently located near town. Indian Creek is home to the world famous SuperCrack. Equipment Rentals are available at many area outfitters. Moab’s towering canyon walls and soaring rock spires are good for more than just sightseeing, they also draw rock climbers from all over the world. Most of the climbing in Moab is done on soft sandstone. When climbing, remember to minimize your impact on the rock, use chalk that blends with the rocks color, and remove all gear when possible. Permits are not generaly required for area climbing. Due to rock climbing’s inherently dangerous nature, all but the most experienced will benefit from hiring a guide service. This popular climbing destination is an easily accessible 500 feet wall that provides a great introduction to Moab area climbing. Wall Street is located off Potash Rd just north of Moab. This area is choked full of crack climbing opportunities, including the world famous SuperCrack, a colossal 5.10 crack climb. The area is located about an hour south of Moab near Monticello. Take UT-191 south to UT211, where you’ll turn left and follow the road into the Needles Distrct of Canyonlands. The parks unique stone arches draw climbers from all over the world. Take note, this areas soft sandstone can make climbing dangerous and technical. There are also special regulations when climbing in the area. No motorized drills are allowed, and climbing is prohibited on any arch identified on current USGS 7.5 minute topo maps, and on balanced rock. Special regulations also exist for specific rock spires and formations so check with the park before climbing. Popular area climbs include Bulbo Tower, Devil Dog Spire, and the Tower of Babel. Located just south of Moab outside of the Spanish Valley, the Kane Creek Canyon is home to dozens of popular climbing routes including Predator Tower, Space Tower, and The Tombstones. Access the area by taking Kane Creek Boulevard south through the Spanish Valley. After passing a BLM campground, you will encounter The Tombstones, the first climbing area. 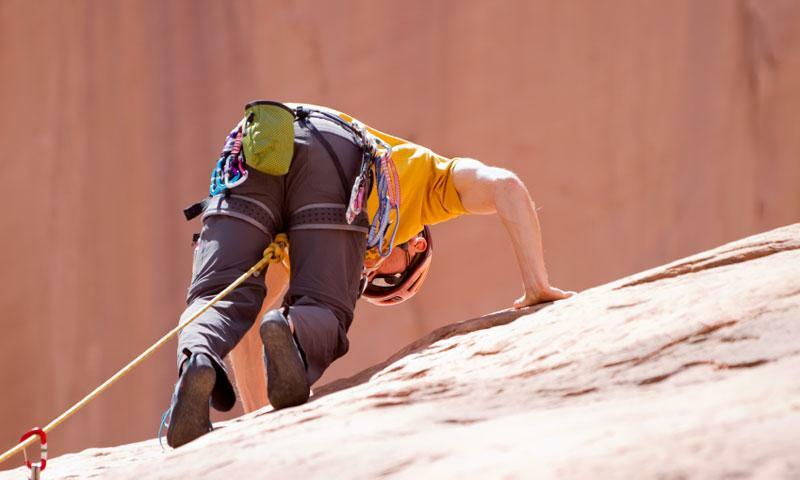 If you’re looking to get the most out of Moab area climbing trip, hire a guide service located on this page. They’ll take care of the planning and logistics so you can just enjoy your climb.